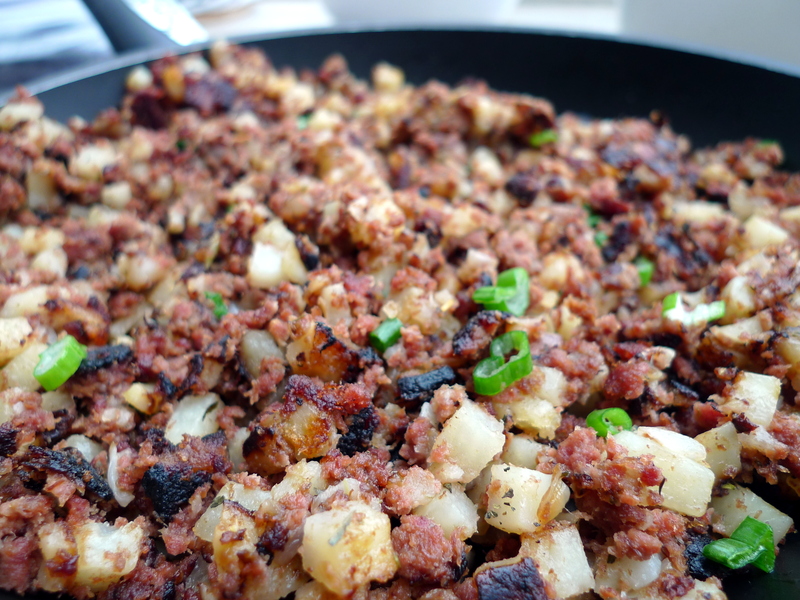 When I was growing up, corned beef hash was a staple for weekend breakfast in our household. However, my family would always just buy the pre-made corned beef hash from the can and skillet it up to serve with eggs. When I decided to surprise my parents with a last-minute trip home and to greet them with breakfast, I wanted to bring back our classic breakfast dish. So I researched online how to make corned beef from scratch anddddd… well, I realized why we always just used the canned version. I think I will leave salt-curing meats to the professionals! So I ended up buying canned corn beef and decided I would at least cook the potatoes and onions myself to feel a little less lazy. Hash is a dish that mashes meat, potatoes, and spices together to form a smooth consistency. Onions and bell peppers can be added to the hash. 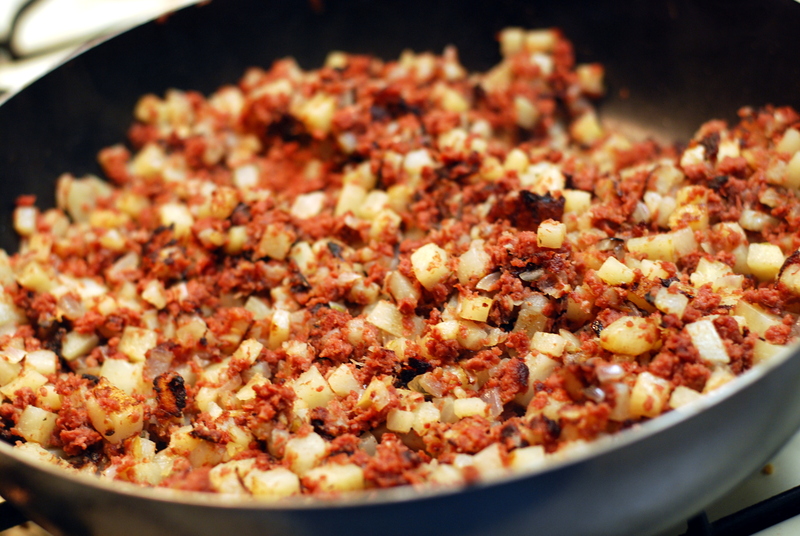 Corned beef hash especially gained popularity during and after WWII due to the rationing of fresh meat. 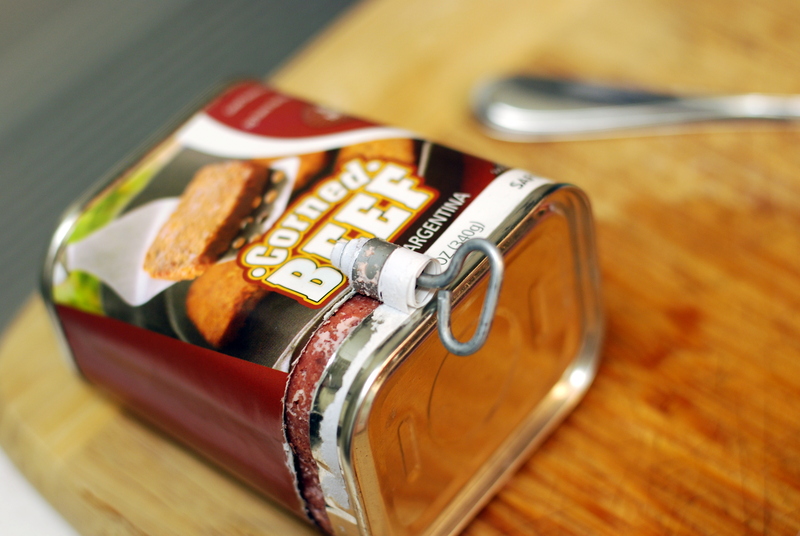 When I bought the canned corn beef from the grocery store, I was fascinated with the key you had to use to open it — I had never actually seen that before. I’m ashamed to admit how long it took me to figure out how to open this thing… but don’t worry people, I have got it now! I used to enjoy corned beef hash with fried eggs, but now I find that combination much too greasy. In my “grown-up” palate stage, I find hash and poached eggs to be the perfect complements. Since I was back in California, I decided to pay tribute to the California Eggs Benedict (basically eggs benny with fresh slices of California Hass avocados). 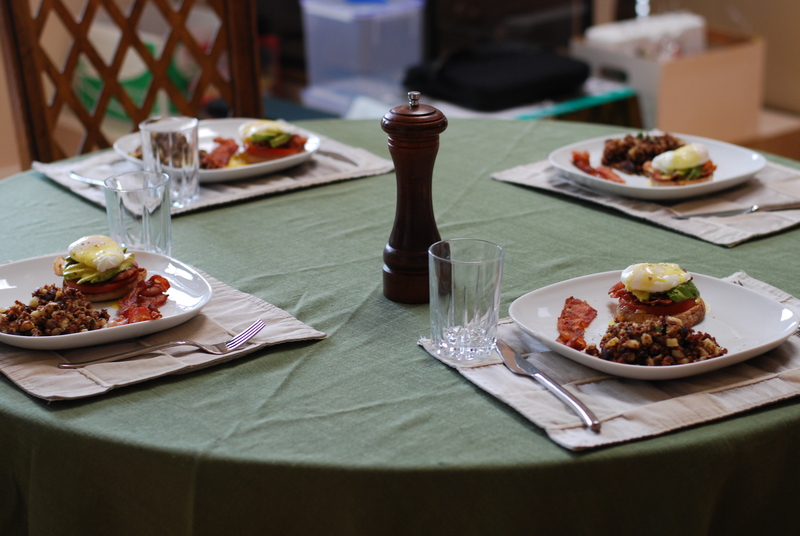 I served the Corned Beef Hash with California Eggs Benedict and a side of bacon for my surprise family breakfast. My next goal is to make the Duck and Mushroom Hash with Poached Eggs I had for brunch at Harry’s Cafe and Steak in NYC. Doesn’t that sound friggin’ amazing? Season with salt and pepper to taste, and garnish with parsley (I used scallions because that was all I had and I just wanted to give it some color).